According to South Korean military officials, North Korea has test-fired four short-range missiles into the sea off its west coast. In a statement, the Joint Chiefs of Staff (JCS) said the missiles had a range of about 87 miles. 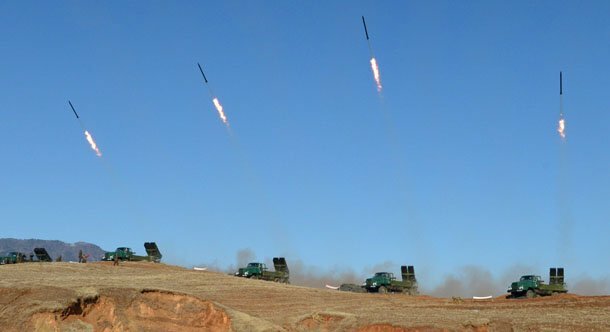 The missiles were fired from Dongchang-ri in the north of the country on April 3, the statement said. North Korea often conducts missile tests in protest at US-South Korean military drills, one of which is ongoing. The US and South Korea say the annual exercises are for defense training purposes, but Pyongyang calls them a rehearsal for invasion. They are always a trigger for a surge in tensions between the two Koreas. When a drill began in March, North Korea fired two short-range ballistic missiles, and on March 13 it fired seven ground-to-air missiles into the sea to coincide with the end of one part of the drill, Operation Key Resolve. A JCS spokesman said today’s test “appeared to have been supervised by Kim Jong-un”, the AFP news agency reports.